Use your fleet graphics to brand and offer! 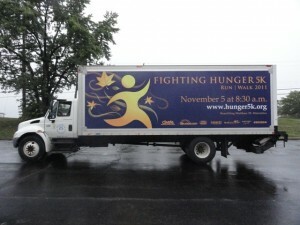 Home » Advertising » Use your fleet graphics to brand and offer! What if I told you your fleet graphics could not only brand your company but, at the same time, make an offer, run a promotion or focus on your seasonal product(s)? The answer is they can. The Advertising Trucks Traxx framing system allows companies to display fleet graphics that brand and offer. For example, a company’s first quarter fleet graphics could feature your logo, website and phone number (like always) along with a promotion featuring their best winter product. At the end of first quarter, these fleet graphics could be changed out easily, quickly and cost effectively with the same branding elements and their annual spring, outdoor sale information. Traditional fleet graphics typically only brand…the Advertising Trucks Traxx quick change truck side billboard system allows you to continue branding and so much more. After all, they are your trucks; it’s your message and your media so use this truck advertising space the best way possible.